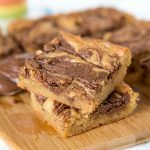 Nutella No Bake Bars – turn a classic no bake cookies into a quick and easy bar with lots of creamy Nutella. 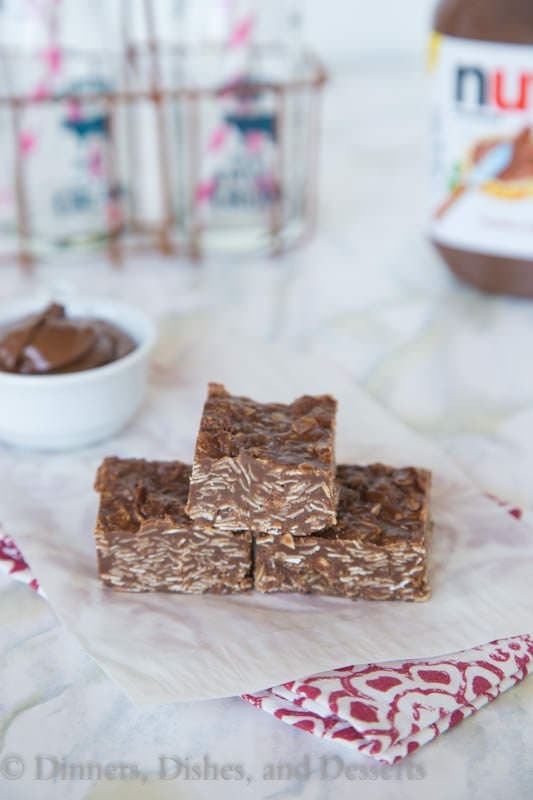 You may recognize these Nutella no bake bars. They have been on the blog for 4 years now. I am just giving them a little face lift. They are relatively popular despite the photos that were with them. I am hoping now, you will want to make them even more! 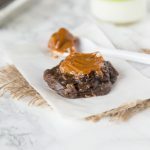 They are even easier than regular no bake cookies, and they are perfect to have in your freezer for when a craving strikes! It is no secret that I like Nutella. 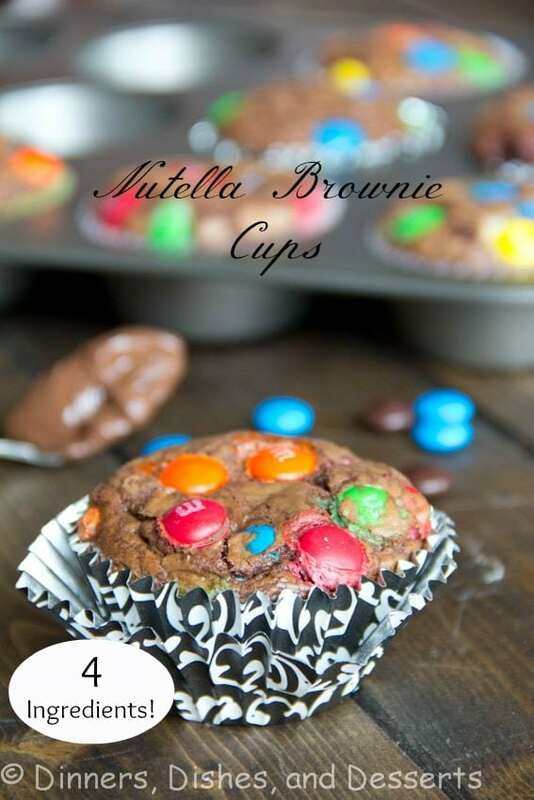 I made my own, turned it into cupcakes, made ice cream…I love the stuff! 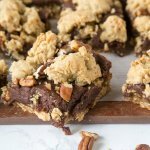 I have been thinking about making no bake cookies with Nutella for awhile. But then I ran out of the homemade stuff. Now that school is starting though, I need to have cookies in the freezer for my son to take in his lunch. Well, I don’t have to, but I like to put a little treat in his lunch for him. 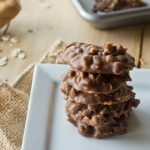 No bake cookies are one of his favorite, the freeze well, and come together in about 10 minutes. So they are a win all around in my book. 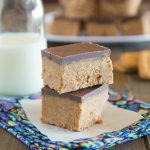 And if there could be anything easier than a no bake cookie, it would be a no bake bar. 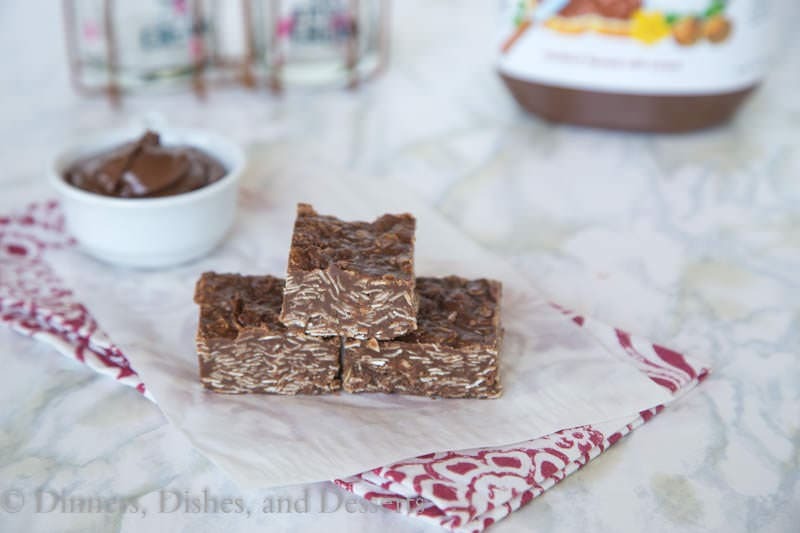 To make these Nutella no bake bars I just took my recipe for No Bake Cookies, and substituted some Nutella. I was lazy, and in a hurry, so I just poured the batter into a pan to make bars. You could make them like normal cookies as well. The bars were just so easy! 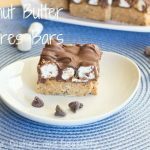 I took them on a picnic we had with friends the other day and they were a huge hit. From age 2 up to the adults they were loved! What isn’t to love? 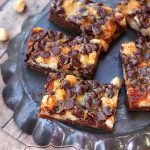 Nutella No Bake Bars - turn a classic no bake cookies into a quick and easy bar with lots of creamy Nutella. In a heavy saucepan, bring the sugar, cocoa, butter and milk to a boil. Boil for 1 minute. Then add in Nutella, vanilla, and oatmeal. 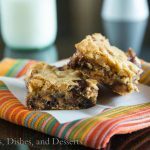 Pour mixture into an 8x8 pan, or drop by the spoonful onto a lined cookie sheet. Put in fridge to harden. I think they are best eaten cold, so I always keep mine in the fridge. Enjoy! Thanks for this post. I made them today and cut them into tiny squares. They’re for a bridal shower, so I put them in white mini cupcake liners. They look like little fudge squares. Love the recipe, thank you! So glad you liked them! Sounds like a cute presentation for a shower! Can I substitute something for the butter? I am not sure what would work. Maybe coconut oil would work. You need something that when it cools it becomes a solid again. Let me know if you try something and it works! I did make it and it sat in the fridge overnight but it didnt get hard. I followed the recipe exactly, what did I do wrong? If you don’t let it boil for the full 1 minute, it will not set up. Hopefully that was your problem. Did you use something other than butter? 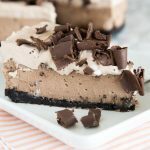 I use the same recipe to make no bake cookies (skip the Nutella), probably once every couple months, and have never had a problem. Do you live at elevation? The boiling point is lower the higher you live, so that can effect it some. But mine have always firmed up 🙁 Wish I had an idea. 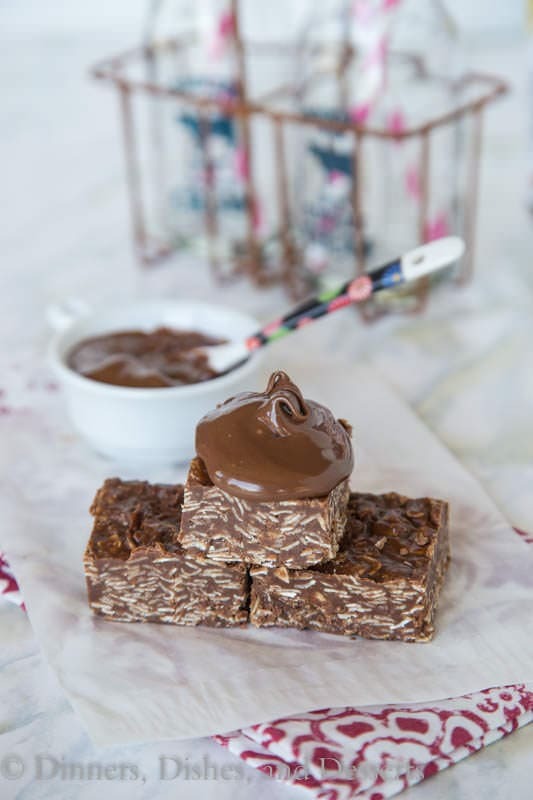 This recipe uses Nutella. 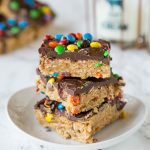 No bake cookies traditionally have peanut butter, so for these bars I used Nutella in place of the peanut butter. Ooh, Ooh, I know what to do! Freeze it and then break it up over top of some scoops of vanilla ice cream! 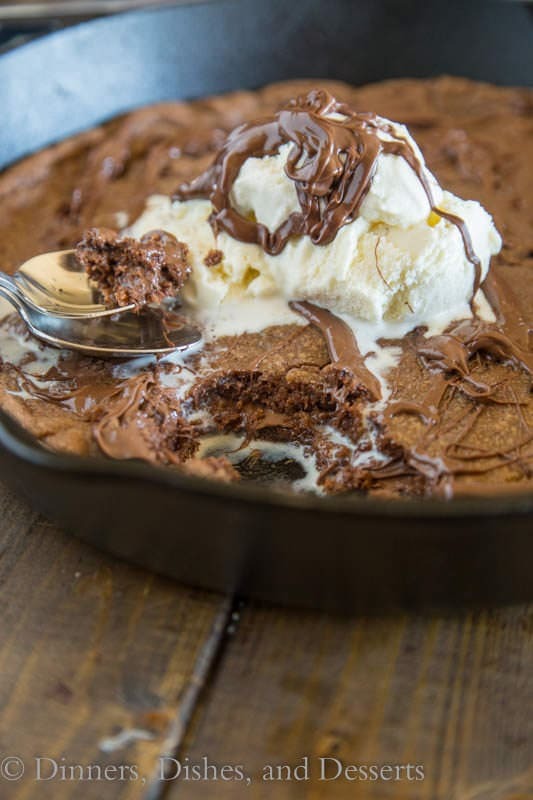 OR…..you could melt it a bit in the microwave and pour it over said ice cream. Yum. Just until all mixed together – about a minute to get everything coated. Hi..i made it..but may i know the consistency looks like? Coz when im done mixing all ingredients..its getting hard so fast.stick to each other quickly us that what seems to be? It does solidify kind of quickly, but if it really hard than you might have boiled it for just a little bit too long. 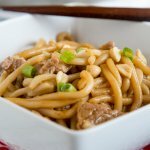 Could i use coconut milk (not water) to substitute for the milk? i have a milk intolerance. I think so, I think it would change the taste slightly. Otherwise I am sure almond or soy milk would work too. Enjoy! Thanks! i don’t mind a taste change, i can’t use almond or soy either. i’m used to the coconut… that’s awesome! 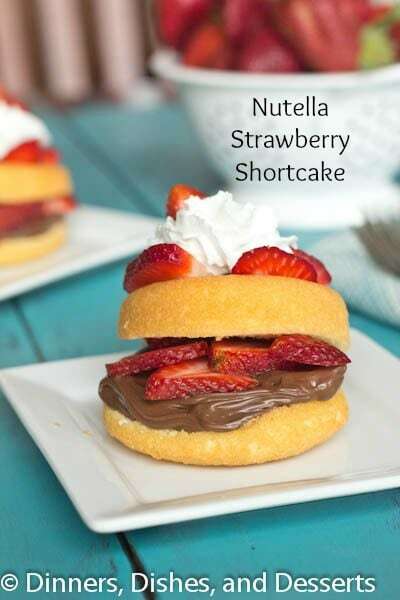 I have to tell you… We are on a Nutella kick right now, so these were perfect! I actually put them straight in the freezer and that helped us not eat them right away!! Thank you, they are perfect! These are gluten-free correct? What kind of oatmeal did you use? I found rolled oats which I think are the same thing? Rolled Oats will work perfectly! I believe some oats have gluten, so you will just want to check those. But yes, I believe they are gluten free! 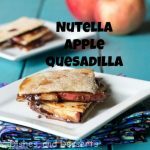 Can this recipe be done without oatmeal? The oatmeal is what gives it body, so I am not sure you could just skip it. 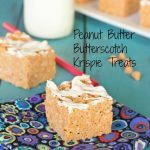 Maybe you could use something like rice krispies in its place (probably not the full amount though). I worry just skipping it would leave just blobs of melty chocolate. 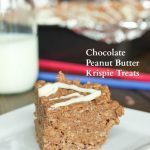 Hi Erin, I would like to try this recipe with Rice Krispies, can you guide me to how much I should use please? I am not sure exactly how many you would use. I might start with 1 cup, and see when you are stirring them in how thick it gets. You can always add more! Let me know how it works! They freeze great, I do it all the time! Would it work to use powdered sugar instead of granulated sugar? I am not sure. It might just melt in with the butter. You could try it though, I have never thought about it. Let me know! Great way to modify them! Glad you enjoyed them. 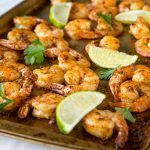 Amazing recipe that is so quick and tasty! I always get nervous making something new for a pot luck, but I couldn’t resist trying this recipe for a pot luck I’m going to tomorrow and I they taste great! They won’t get too hard if I leave them in the fridge all night, right? I’m going to make them again for this weekends BBQ. Thanks so much!! They will be great in the fridge overnight. I would just take them out at least 30 minutes before you want to serve them, so they soften up a little bit. Hope you enjoy! hi, what milk did you used? Full cream packet milk or condense milk? Please reply me!!! Siawhwee I used skim milk, because that is what I always have on hand. But whole milk, 2% or most other milks should work as well. Also, must the snack be kept in the fridge? Can they be left in the open after they settled? No, they do not need to be kept in the fridge. I leave mine in an air tight container on the counter. Okay! Thank you so much! Will try with full cream milk! 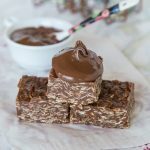 I really love no bake options! Thank you for sharing!